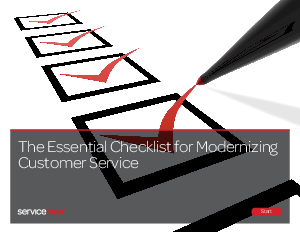 Ready to learn what it takes to modernize customer service? Our checklist unlocks key secrets to transforming your customer service function without increasing your budget. Difficulty connecting all service processes end to end? Siloed departments that don’t communicate with each other? Time?consuming manual processes that leave little time for strategic projects? Discover six strategies for modernizing customer service by overcoming these common obstacles to fast, efficient service delivery.